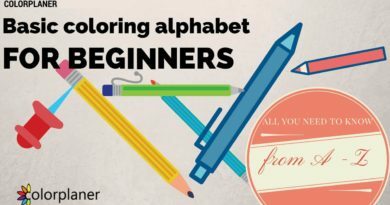 Hello adult coloring fans! 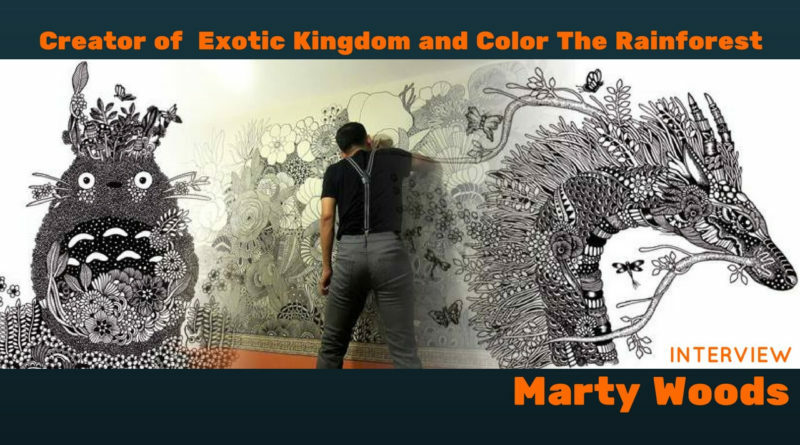 Today we have an interview with a creator of coloring books Exotic Kingdom and Color The Rainforest. 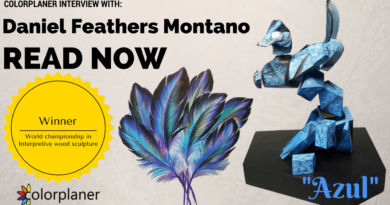 I'm happy to present you an interview with Marty Woods. Q: First of all tell us little something about yourself. My name is Marty and I am a self taught doodle artist based in Kuala Lumpur, Malaysia. I am a computer science graduate and currently working as a computer programmer. I am also a freelance artist with worldwide clients and customers. I loves animals and nature, hence the heavy influence in my work. My subjects are always tangled and intricately infused with nature elements such as roots, flowers, leaves, trees and animals. I mostly use black ink and pencil as my mediums. My aim is to make my audience appreciate the beauty of nature in a mesmerizing way through various lines, shapes and patterns. My drawing style is best described as intricate black and white drawing, with a touch of zentangle, and infused with nature elements. My fans can immediately recognize and identify my work by just looking at it. My signatures include crisp clean lines, intricate forms and patterns, layers upon layers of elements and full use spaces. Q: How did you start to color? When did this attraction begin? Before I started coloring, I am an artist first. Basically I am already coloring but not because of the trend. Then in 2015, the trend is getting bigger and I started creating coloring pieces, and I joined several coloring groups on Facebook. I don’t have many coloring books but I do own several books from local illustrators such as Sanuri Zulkefli, Rizal Paperbag and Sarah Salim and some from international authors such as [easyazon_link identifier="1523692057" locale="US" tag="color-planer-20"]Irina Vinnik[/easyazon_link] and [easyazon_link identifier="1604697377" locale="US" tag="color-planer-20"]Zoe Keller[/easyazon_link]. Q: Do you use coloring as a small getaway from the real world? Absolutely! I find both drawing and coloring as very relaxing and therapeutic. I always find myself absorbed in these two activities. I think it also helps me to enhance my creativity and keeps my brain sharp. Q: How do you prepare before coloring? I don’t really prepare before I start coloring. However, I always already have in mind how I want the end results such as the colors or the theme or the background, so that makes coloring easier and less mistakes to be made. Q: Where do you get the ideas? What inspired you? Nature is what inspired me the most. I enjoy taking photos of things that I can use for my drawings, from plants I spotted in shopping complex to trees or leaves I saw while waiting for trains. I am lucky to have plenty of interesting places nearby where I live such as Botanical Garden, Bird Park, Animal Farm and Butterfly Park, so I make sure I take a lot of photos whenever I visit these places. There are always something new to see that can inspire you. I also enjoy reading illustrated books about plants and animals. Q: Describe your illustrations in three little words:) Intricate. Doodle. Unique. Q: How would you describe your workplace? I have tiny studio at home but I prefer to draw at public places such as fast food restaurants, cafes or food court. I’d pick a secluded spot and spend hours drawing. I always bring my drawing necessities whenever I go to work or going out so I can draw anytime. Q: Do you work with a team? If so, how many people you work with? I work alone but for my coloring book I do have a team of wonderful 3 or 4 people people helping and advising on the publishing part once I have completed and submitted all the drawings. Q: In your opinion, why do your illustrations appeal so much to adults? I think you can’t really go wrong with plants and animals, almost everybody love them. They are always beautiful when colored. When I created the book, my aim is to have each piece beautiful and can be enjoyed and appreciated even in its original black and white form. Each one is a piece of art and not just lines and shapes to be colored. Also, I think my drawing style is very unique and many people can already identify and associate it with me. Q: What are your favorite supplies for coloring? Do you always use the same or you like to experiment with it? So far I am only using [easyazon_link identifier="B000EWYCX0" locale="US" tag="color-planer-20"]Faber Castell Polychromos[/easyazon_link] for my colorings, but I also use markers and gel pens. Q: Why do you prefer working with pencils as opposed to digitally? I love the feeling of doing art traditionally. I get the satisfaction from the delicate hand drawn process and the organic end results. I have always preferred imperfect organic looks and lines instead of perfect lines and symmetrical images. I have a lot of respect for digital art too but at this moment as just don’t see myself as a digital artist. Q: Do you have special techniques and color mixes that you'd like to share with us? Any tips and tricks? I don’t have any special techniques but always test your color and medium especially if you’re not sure about the paper of your coloring books. Also, if you are using color pencils that has a lot of colors such as [easyazon_link identifier="B000EWYCX0" locale="US" tag="color-planer-20"]Faber Castell Polychromos 120[/easyazon_link] or [easyazon_link identifier="B005O2ZU68" locale="US" tag="color-planer-20"]Primacolors Premier 150[/easyazon_link], it’s good habit to note down the color codes as you color because sometimes you forgot which one you have used especially when you have over 10 shades of reds or greens for example. Q: What challenges (if any) did you face in making your coloring book for adults and can you give other artists any tips for solving similar problems? Be original (do not copy or steal from other artists), know your audience, do research and be prepared to do a lot of marketing on your own. It’s easy to just jump into the wagon and do coloring books because you can draw but some drawings or styles are not suitable for coloring books. You must consider many things. For example, for my non-coloring book illustrations, I love to do intricate drawings with lots of tiny detailing which is actually not very appealing to colorists as it is very difficult to color, so I have to make changes to my drawings without sacrificing my unique styles. Q: Do you test your illustrations on a specific group of coloring community members before publishing? I have never really shared my illustrations before publishing as most of the time they need to be kept secrets but I do shared several illustrations within a closed circle and asked for opinions. In my opinion, you don’t want to share too much as it can kill the excitement and thrill for your fans but a few glimpse of your work can create buzz for you too. Q: If you could choose only one of your finished coloring page which one would it be? And why? It would be Guardian of the Royal Belum Forest from my book[easyazon_link identifier="0373100000" locale="US" tag="color-planer-20"]Exotic Kingdom[/easyazon_link] colored by Kazuhiko Azmi. I personally love the drawing and the story about ancient giant snake guarding the forest, and I love it even more when Kazuhiko colored the drawing. The snake looked dangerous and mysterious but at the same time magical and stunningly beautiful. Q: What’s your favorite thing from your latest coloring book? The owl that is used as the cover for my second book,[easyazon_link identifier="0373135467" locale="US" tag="color-planer-20"]Color The Rainforest[/easyazon_link]. The owl is originally is not drawn for the book. It is one of the drawings I made even before I created the coloring book. It’s quite intricate with lots of fine detailing and definitely not a coloring book material. However, the publishing team decided to use the owl as a cover and I think it’s perfect to represent my original style and also the rainforest. Q. How do you feel about the success of your coloring books for adults? First of all, I am very grateful and humbled by all the support from my followers and fans. Thank you very very much. I still can’t believe it when I saw so many people sharing their colorings from my book in social media. I am always thrilled whenever I saw my books appeared on the other side of the world, or when I was tagged by fans, or when people messaged me and told me that they loved my book so much. It’s been really amazing so far. I’m really thankful. Q: What drives the adult coloring trend according to your experience? Apart from the health and therapeutic benefits we already know, I think it’s the joy and fun we get from making beautiful masterpieces. Sharing it with friends, getting together, socializing and making friends with strangers – all because everyone has one common interest that is coloring! Some people who tried coloring don’t even know that they have the talent, the artist within to turn a simple illustration into beautiful masterpieces! Also, more and more great and original coloring books being published also help to strengthen the trend in my opinion. Q: Do you have a favorite coloring book author? How did he/she earn your admirations? My favorite author would be [easyazon_link identifier="1523692057" locale="US" tag="color-planer-20"]Irina Vinnik[/easyazon_link]. 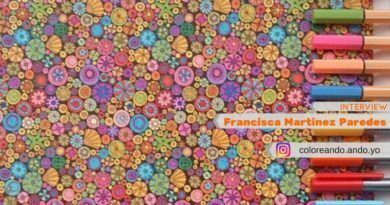 I have always loved her work even before she published her coloring book [easyazon_link identifier="1523692057" locale="US" tag="color-planer-20"]Manic Botanic[/easyazon_link]. Her work is not just beautiful but mesmerizing and captivating at the same time. When you see a book that is created by a true artist, what you see in each piece is not just a coloring piece but a piece of art, a masterpiece. Q: What would you like to see more in adult coloring book world? I think there are too many coloring books right now, and everyone is jumping in the coloring for adult trend but sacrificing the overall quality of the books, and this is hurting both colorists as well as true artists/authors. I hope to see more books with overall good quality from the paper used to the original and great illustrations. Also, in many countries, coloring is still seen as only for kids. I hope one day people will realize and understand that coloring is a healthy and fun activity that can be enjoyed by everyone regardless of their age. Q: And last but not least, where can we find your coloring books? My books are basically available worldwide. Besides on all Amazon sites and Book Depository, my books are also available from Barnes & Noble, Walmart, Kmart, Books A Million, IndieBooks, MPH Bookstores and Kinokuniya. For a complete list where to get them, please visit my website. Follow me on : www.instagram.com/martywoodskk www.facebook.com/martywoodskk and visit my website: at www.martywoods.wix.com/martywoods Lastly, I’d like to thank everyone who supported me and my books. Many thanks to the colorists who shared their colorings with me. Without them, my coloring books would not mean anything.